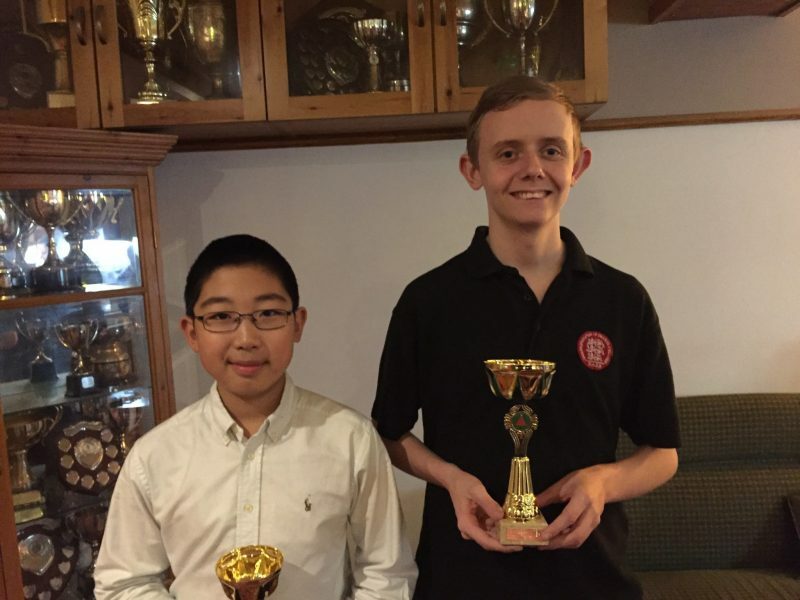 LONDONER Adam Stacey (pictured right with fellow finalist Bowen Zhu) had the consolation of collecting the Plate trophy at the eighth legs of the Cuestars South of England Under-21 Tours. where all five players won two matches. But he bounced back to overcome 12-year-old Bronze player Bowen Zhu (Chandler’s Ford) in the Plate final of the event sponsored by Swindon-based Smarter Cue Sports. Zhu had beaten Kaine Petty (Fordingbridge) in the last-eight on a re-spotted black after clearing the table with his highest Cuestars break of 35. The ninth leg of ten is at Chandler’s Ford Snooker Club on Sunday, April 9. For more information about Smarter Cue Sports, which supplies cue sport products to clubs and retailers, visit www.smarter-cuesports.co.uk. PRELIMS: Nat Kidner (Greenbaize, Bournemouth) beat Arron Smith (Selsey RBL, Chichester), Adam Stacey (Legends, Leytonstone) beat Oscar Livesey-Lodwick (Nailsea Social Club), Callum White (Copnor SC, Portsmouth) beat Ally Pollard (Salisbury SC), Brett Wallace (Fareham SC) beat O’Shay Scott (Chandler’s Ford SC). QUARTER-FINALS: Stacey beat Kidner, White beat Wallace, Arnie Petty (Salisbury SC) beat Will Forster (Mayfair, Gosport), Bowen Zhu (Chandler’s Ford SC) beat Kaine Petty (Salisbury SC). SEMI-FINALS: Stacey beat White, Zhu beat Arnie Petty.